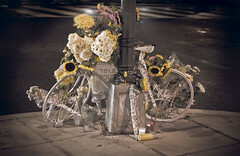 The Ghost Bike memorial to Alice Swanson was removed by the Mayor’s Office over the weekend from its home near Dupont Circle at Connecticut and R, the spot where cyclist Swanson was killed on her commute to work. It’s not clear why the Mayor’s Office removed the memorial without so much as an explanation, and attempts by local outlets to reach the Mayor’s office for comment have gone unanswered. DCist has photos of the replacement memorial put up by community members yesterday. So, WTF Mayor Fenty? What’s up with removing the ghost bike memorial?